I suddenly grew tired of Awasa, and need the rush of a new city with a different view of the world. I paid 10 Birr for a Baja Taxi to the Awasa, Ethiopia bus station, and then took an 18 Birr Mini Van to Dilla. I left the room at 6:00 am, and finally settled into a room at 9:45 am. 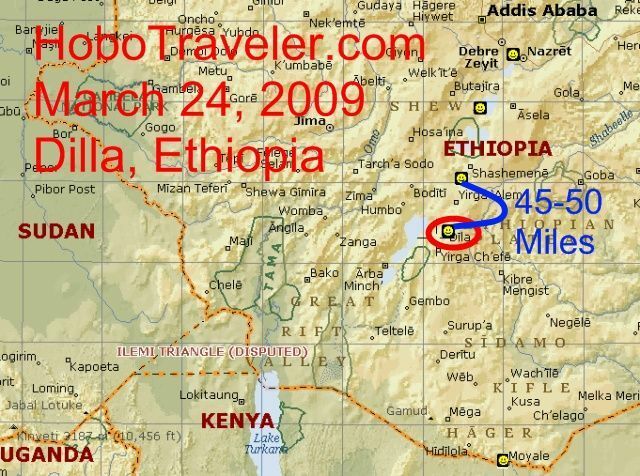 It probably took me an hour to choose a Hotel in Dilla, the place is another one of them Truck Stop cities of Ethiopia, however a little more interesting then others. Traveling in Ethiopia has been incredibly easy, I just cannot complain about the transportation. If you play your cards right, wake early, arrive to the bus stations correctly, and do not listen to the wrong people this country is a cakewalk. Generally, and honest bunch, there is not much arguing. Today I paid the Baja Tuk Tuk Taxi one dollar to take me to the Bus Stop, it was probably double the going price. However, it was a no argument price, and was easy. The Baja’s are much better transportation than the motorcycle taxis of West Africa, truly an upgrade in quality of transport. After leaving Awasa, the land changed from a flat gravel and dust pit to rolling hills with some trees and farms. The place is not a green heaven; however, it does not continuously feel like a flat gravel pit, not there are hills. I found an internet café, they say it will be working later this afternoons, I know the are optimistic.